There's something about gadgets and tech-related accessories made from wood that just oozes green kewl. Take for instance these engraved bamboo iThing cases, this bamboo laptop, or this simple wooden cable wrap. All natural, all simple (ok, maybe not the designs on the iThing cases, but the cases themselves are simple) and all gorgeous. 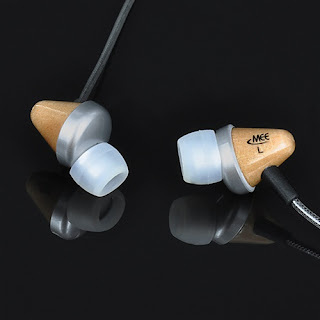 So with that in mind, check out these sleek and simple CW31 earbuds from MEElectronics. They boast a small form factor that sits in-ear and claims to reduce ambient noise. That's a great feature because you can in turn use a lower volume, which is better for your ears. Incidentally, that would also be good for the people around you since they wouldn't have to listen to your music or podcasts along with you (a recurring pet peeve by this bus commuter). An additional feature which I appreciate is that they come with 5 sets of silicone ear tips so you can size them to your ears. That's a feature I appreciate since I have small ears and have trouble getting earbuds to stay in them when I'm on the move. And they're really pretty to look at. I mean, of course, no one will see them when they are in your ears. But I love design and these are really quite lovely. Something about the curve and the natural patina of the wood that I just adore. You can check out a bit more detail in the video below.